In a large mixing bowl, combine 1 cup of Three Bridges Marinara, the ground chicken, Italian breadcrumbs, ½ the parmesan cheese, garlic, onion, Italian seasoning, 3 tbsp of the Three Bridges Superfood Pesto and the egg. Season with Kosher Salt and Black Pepper. Mix well but do not over mix or you will have tough meatballs. Using a 2 oz scoop, portion out meat mixture and place on baking sheet. After all meatballs have been scooped onto baking sheet and roll into balls. TIP: If you lightly wet your hands the meatballs will form better and crack less. Remove from oven and hold warm. To Serve: Heat the remaining Three Bridges Heirloom Marinara in a large skillet. Cook the Three Bridges Organic Linguini according to package directions. Drain well and add to the Heirloom Marinara sauce. Mix well and season with kosher salt to taste. Divide the sauced Linguini evenly into 6 dishes. 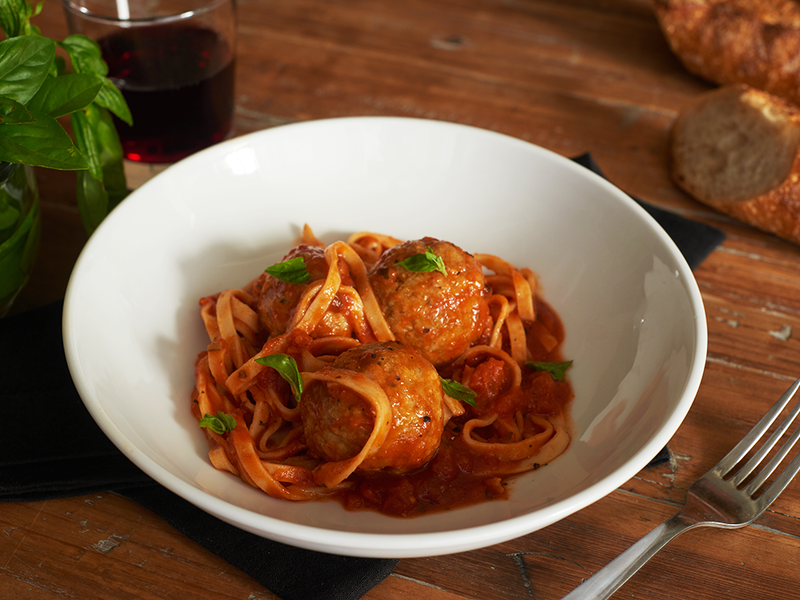 Divide the Chicken Parmesan Meatballs among the 6 dishes. Sprinkle each dish with the remaining ½ of the parmesan cheese evenly. Serve & enjoy!